July | 2011 | Ipoh Mali Talak Sombong! 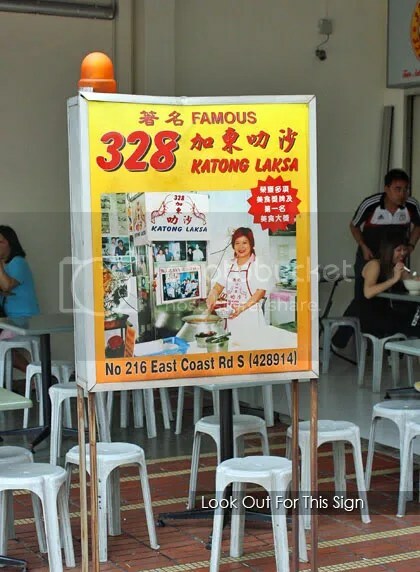 The first time I heard of Katong Laksa, it was from KL People KL Food. At that time, I was kinda amazed at the fact that it has to be eaten without chopsticks (no kidding!). 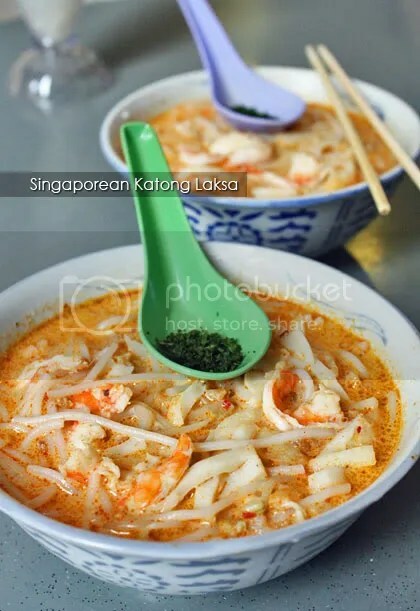 Stories had it that this variant of curry laksa, originated from the Katong area of Singapore but there are a lot of proprietors dishing out the same dish all over Singapore (talking about competition) – it is almost impossible for many people out there to really determine which one is authentic. The coconut milk content in Katong laksa is higher than the usual curry laksa, hence the slightly pale orangey-red curry broth. Talking about laksa, there are two main types; the curry laksa and assam laksa. Curry laksa, as you might already know, is a coconut-based curry soup with noodles, while the latter is a sour fish soup with noodles. 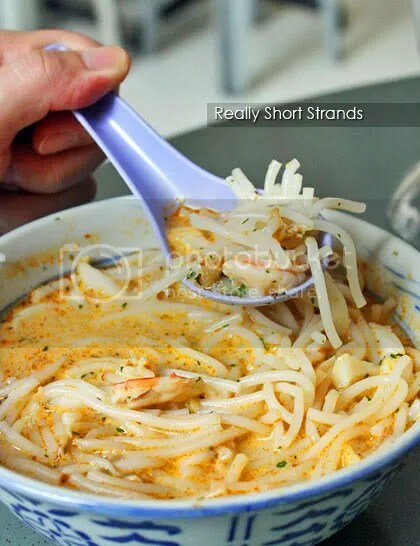 Commonly used noodles is the lai fun or laksa noodle – a white, rounded thick rice noodle (similar to loh shee fun but longer and less thick in shape), but different types of noodles are used in different places, such as Johor, where spaghetti is used instead of lai fun, where else, rice vermicelli (meehoon) is commonly used for Sarawak laksa. Ops, I think I digress. 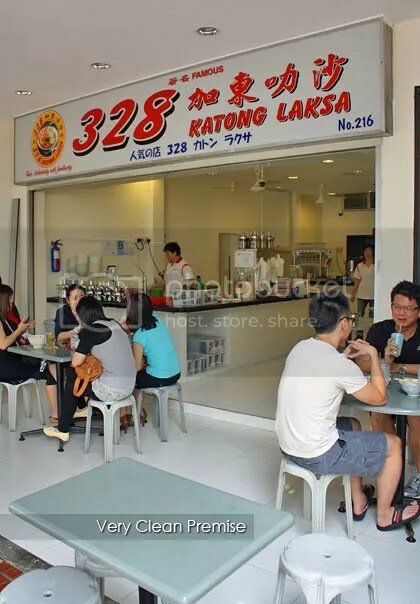 I finally got the chance to try out Katong laksa with Danny’s help. He was courteous enough to wakes up early on a weekend morning to bring us to have laksa for breakfast. But since Danny is not a typical foodie himself, he don’t really know which one is the authentic. Therefore, he brought us to this place, which is the nearest one to where we were staying – 216 East Coast Road. This is supposingly the newer outlet on the same street. Coconut milk definitely is higher in this variant of curry laksa. The noodles (SGD 4 for small, SGD 5 for medium and SGD 6 for large) they used is slightly smaller than the usual lai fun and cut up into shorter strands so that the entire dish can be eaten with a spoon alone (yep, no chopsticks, no fork). Normally served with chopped daun kesum, prawns, cockles, sliced fish cake and bean sprouts, we asked them to omit the seafood (me not a selfish shellfish person). As the coconut milk ratio is higher than curry paste, the spiciness has been toned down. People who can’t take spicy stuff will be thrilled with this laksa, but not for those who can’t take food heavily laced with fatty acids. The curry broth was flavourful with spices like lemongrass, turmeric, galangal, chillies and belacan but I would suggest to thread with care as you might get nauseous or bloated if you’re sipping too much of the santan-laden broth. If you want it to be more fiery hot, add in the sambal provided. For more stories, hop over to Pureglutton and VKeong. When New Zealand is mentioned, immediately breathtaking landscapes, kiwi fruit, extreme sports like bungy jumping (wheeee!! ), sheep, kiwi bird, Les Mills :p and Lord of The Rings will come to mind. Comprised of two main landmasses; the North Island and South Island, New Zealand is a must-visit for all nature-lovers. After the Christchurch February 2011 quake, we were skeptical to stay and travel around Christchurch. 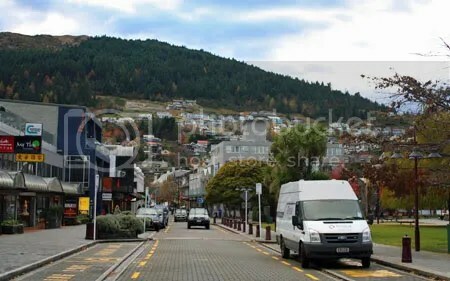 We then decided to rent a car and tour the South Island, from Christchurch to Lake Tekapo (along the northern edge of the Mackenzie Basin), then further south to Queenstown (and the surrounding area such as Cromwell and Milford Sound), to Franz Josef at the West Coast region (glacier! ), up to Picton at the north of South Island, back to the East Coast region to Kaikoura and finally, Christchurch for our flight back. 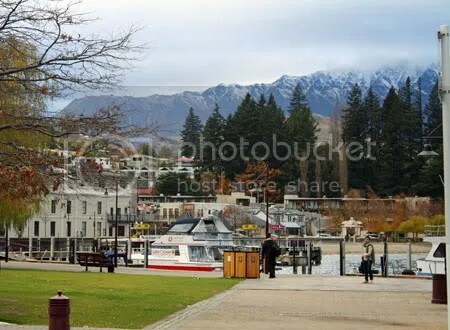 Of all the places we went, Queenstown is one of the places we felt in love with. From food to shopping, scenery to weather, extreme sports to the hospitality of the people there – this charming resort town has so much to offer and yet, so little time to indulge ourselves. Travelling to NZ during autumn proved to be a chilly experience, something that can never be experienced back in Malaysia. 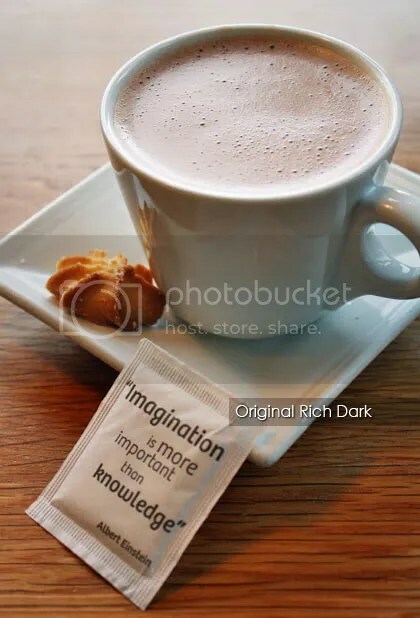 But it would turn out to be really cold, with the lowest temperature reached 4 degrees Celcius while we were there, so a cup of hot chocolate would be perfect. Talking about chocolate, how about chocolate for breakfast? 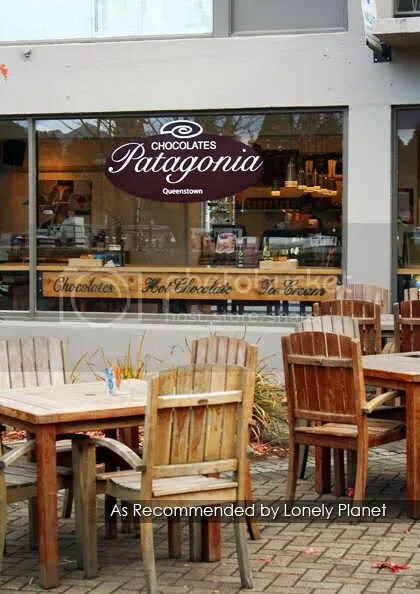 Opens from 10am – 10pm daily (business hour varies during autumn and winter season, best to check ahead), Patagonia Chocolate appears as one of the top pick for quick eats in the Lonely Planet’s New Zealand guide book. Patagonia offers more than what a foodie could find; home-made chocolates and ice creams, lakefront location and free wi-fi too. They have four types of hot chocolate, CK chose the Lavender Chocolate (NZD 5 for small). 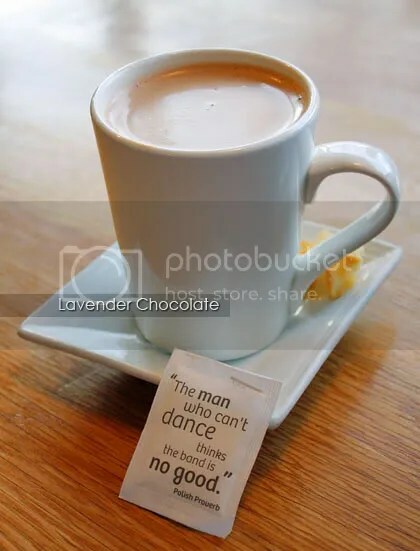 A faint smell and taste of lavender infused into the hot chocolate soothes the senses at first sip… we kept on sniffing on the aroma! EQ chose the original dark (NZD 6 for big). 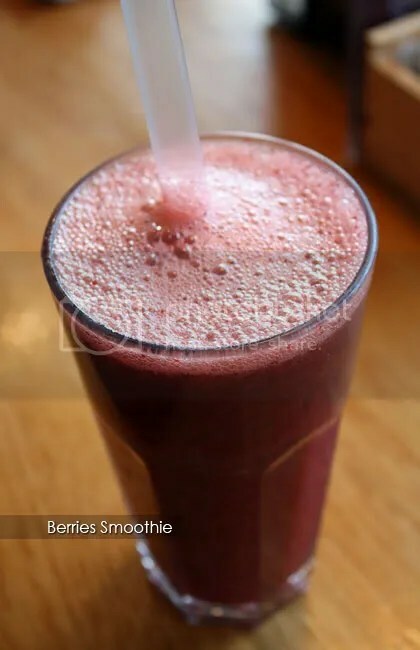 Something more refreshing, Berries Smoothie (NZD 7.50 for small). 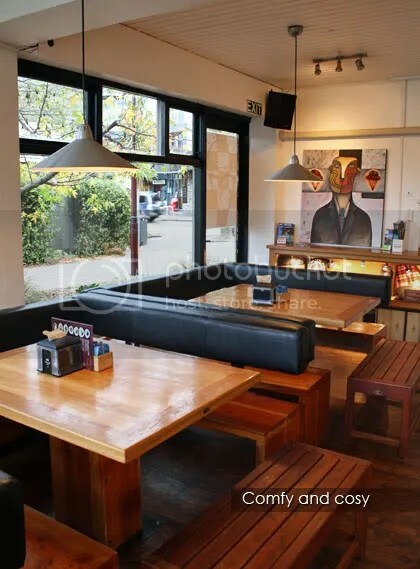 For breakfast, they have 7 choices, ranged from croissant to bread, muesli, salad, yoghurt or combination of them. 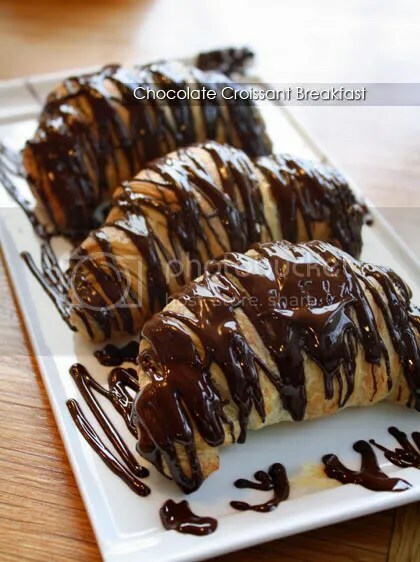 Chocolate Croissant (NZD 12) came in a set of 3, drizzled with their home-made thick chocolate sauce and serve warm. The croissants were one of the best I’ve tasted so far; buttery, soft and moist and the chocolate sauce complement it very well. 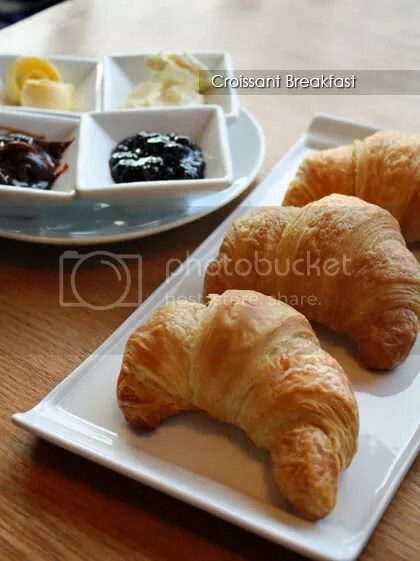 EQ and EY shared the Croissant Breakfast (NZD 10), also came in set of 3 with 4 types of spread (butter, peanut butter, cream cheese and blueberry jam). 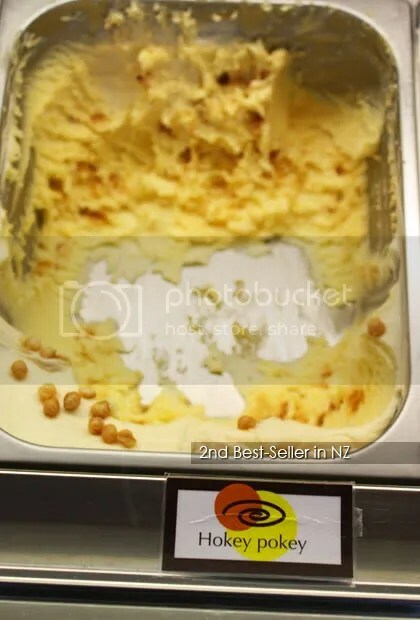 We did not try this as we were stuffed but just for your info (if you haven’t know this already) that Hokey Pokey ice cream (vanilla ice cream with crushed sponge toffee) is second best-seller in New Zealand after vanilla. 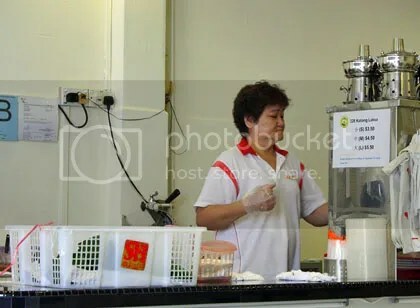 If you’re a fan of modern kopitiams, then you might want to try out Hainan Tea. Taking over the spot where Leo’s Cafe used to be, it became one of CK’s favourite spot for weekend breakfast, mainly because he can’t stand the heat while dining at coffee shops and hawker centres. 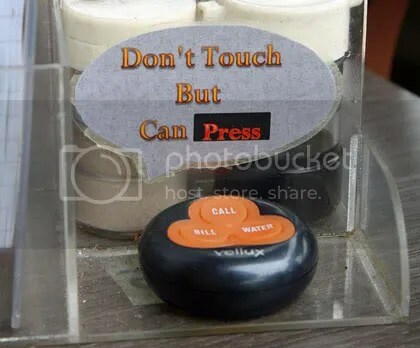 *tsk tsk tsk* Apparently, they have been around for quite some time, starting with their outlet at Low Yat Plaza and only expanded to PJ and Puchong just recently. 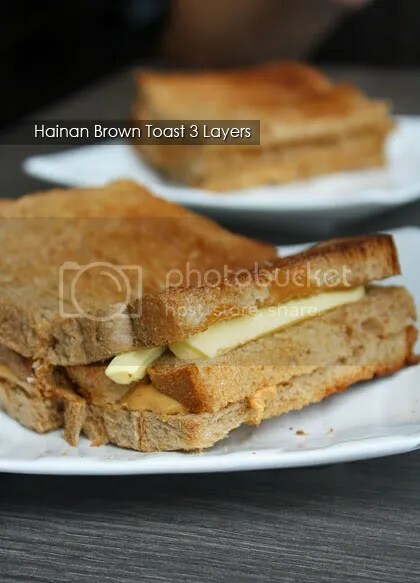 They have quite a number of interesting stuff on the menu (or should I say, innovative) like this Hainan Brown Toast 3 Layer (RM 3.80). Generous spread of butter, kaya (coconut jam) and peanut butter sandwiched in between 3 pieces of brown toasts – you get a myriad of flavours (slightly salty, sweet and egg-y at the same time). Good stuff! 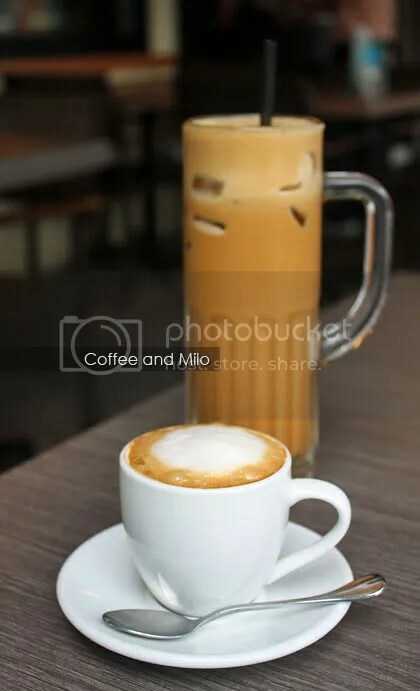 The usual coffee and iced Milo fix, and also the Honey Cucumber juice. 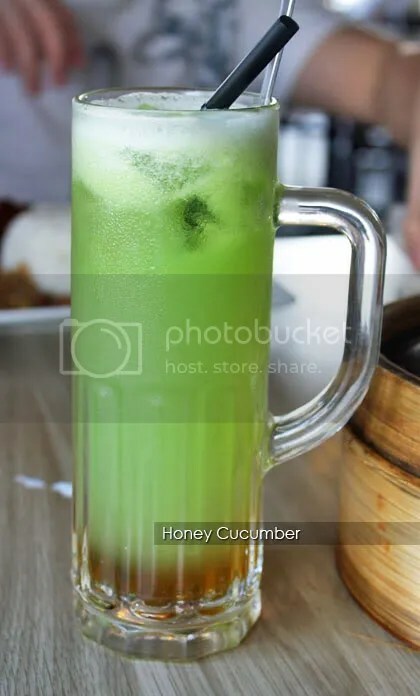 I love cucumber juice for its refreshing aftertaste and this one is quite a potent thirst-quencher. The menu says “hainan noodle” but in fact, it is wantan noodle. 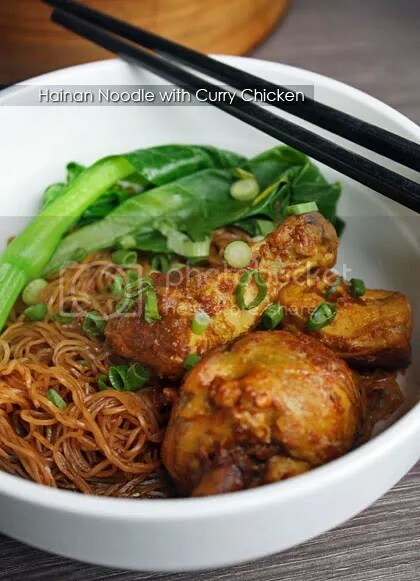 The Hainan Noodle with Curry Chicken came with big, tender chicken pieces and not overly spicy but the overall dish was a little bit too dry. More curry gravy would be a nice change. 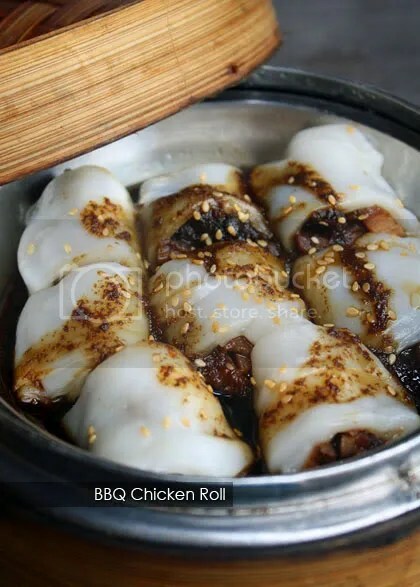 BBQ Chicken Roll (RM 6.90) – steamed rice roll or cheong fun/chee cheong fun with diced barbequed chicken was kinda bland. The filling were not fragrant enough to our liking, although the sauce given was aplenty. 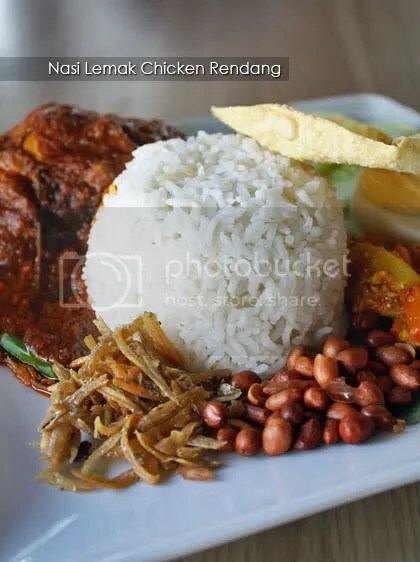 The Rendang Chicken Nasi Lemak on the other hand, has quite a number of condiments, including the acar (tangy preserved vegetable with spicy peanut sauce), a big piece of rendang chicken thigh and papadam. No complaint on this one.